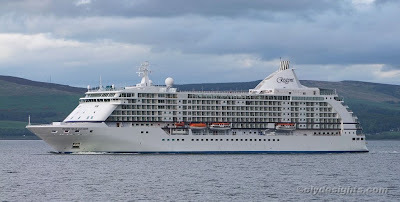 Leaving Greenock this evening was SEVEN SEAS VOYAGER, a ship owned by Regent Seven Seas Cruises and which was built in Genoa, Italy by the Mariotti Shipyard. Launched in September 2001, she was completed in March 2003. At 42,363 gross tons, SEVEN SEAS VOYAGER is 206.5 metres long. Her current cruise commenced on 21 May at Reykjavik, and called at Thorshaven, Kirkwall, Portree and Belfast before she arrived here this morning. Her next ports will be Dublin, Cobh and Portland before she ends the cruise at Southampton on 31 May. She was recently drydocked at Genoa to have one of her podded propulsion units repaired, after it had sustained damage from fishing gear that got entangled in the Indian Ocean. Been quite busy with some other projects but still get a chance every week or so to check out your blog, superb additions John, keep up the good work.